Cold weather has finally blanketed much of the nation today, bringing to mind that ski season is near. When I go cross country skiing, there's nothing better than hanging out in a cozy lodge at the end of a long day near a roaring fire with a glass of wine. Normally I curl up on a strategically placed arm chair or sofa far from any chilling breezes, wearing a fleece jacket and pants and thick wool socks. 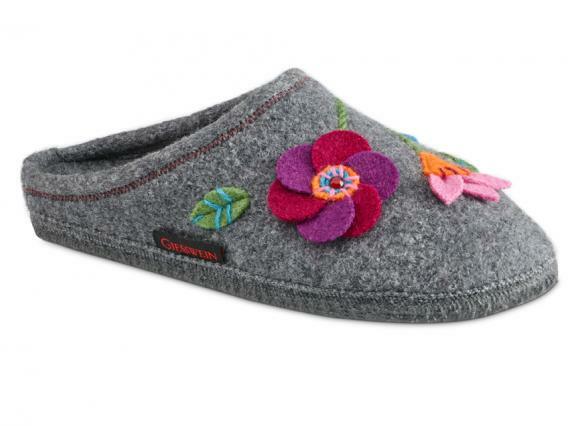 But these colorful slippers by Giesswein are warm sans socks. First, I fell in love with the hand-stitched floral motif, representing the wildflowers you'd find in Austrian fields. Then, I marveled at the comfort, especially because I didn't expect the quality arch support. Though it's constructed of wool, the upper isn't itchy on my bare feet that also didn't sweat in this slippers. Finally, the natural materials fit my eco sensibility: the dyes are derived from vegetables; no synthetic cements or glues were used in its manufacture and only natural materials were used in its construction -- aside from the wool, there's recycled carbon, natural jute and rubber.